June is PTSD Awareness Month. I have noticed that a large portion of our US Flag Store community “likes” the posts on Post Traumatic Stress Disorder, and I wanted to dig a little deeper. It’s a sensitive, serious subject, and please correct me gently if I step on any toes. PTSD is a broad term used to describe any disorder triggered by severe trauma. While we use it on our website to refer to military personnel and vets who suffer because of it, it is a very real condition for many who have never been in battle. I cannot imagine the trauma suffered by those who have. My first husband committed suicide. I have been abused, among other things I’d care not to share online. Additionally, in the last 8 months I have gone through a divorce (second husband), terminal cancer diagnosis for/subsequent care of/death of a parent, job change, city relocation, home purchase; I figured if any civilian was borderline suffering from something traumatic, it would be me. Not. I passed with flying colors. However, I immediately answered “yes” to all four questions answering for my boyfriend, whose teenage son was killed in an auto accident. I already knew I can’t possibly fathom what he lives with, day in and day out. So here is the tender part: I am writing about something whose depths I do not understand. If you are reading this, please don’t misunderstand that I think I know what you are going through, that I could offer platitudes or begin to understand what you have seen and felt. You deserve more than that. I read over this article after it is finished and my words seem so trite. It was an exercise in educating myself. Please take my findings as simply that: a collection of resources that I found online, that may direct you to help if you or someone you love needs it. Important thing to remember: You are not alone. This can’t be said enough. 7.7 million Americans aged 18 and over suffer from PTSD, also known as shell shock or combat stress. It can be brought on by a variety of events, regardless whether you were physically harmed or not. Common symptoms include nightmares, sleeplessness, depression, numbness, anger, irritability, inability to focus, and myriad other things that reduce your quality of life. Symptoms often do not manifest immediately, and may not be constant. Factors that can contribute to an event leading to PTSD include intensity, physical pain, loss of loved one, proximity, lack of control, and lack of support after the event. That last one screams that it is imperative to get support as soon as possible, even if you feel fine at the time. Many sufferers report handing the condition with drinking, suicidal thoughts, workaholism, and isolation. These things actually eventually exacerbate the issues. There is. PTSD has been recognized as a viable condition and researchers from around the world have increased our understanding of it and how to treat it. Medication and counseling are the two most effective methods of treatment. Counseling can help you understand and cope with what you are feeling while medications can block feelings of excessive despair. You can make lifestyle changes to help you on the path to recovery also – communicating with loved ones about what places or situations make you uncomfortable; volunteering in your local community can offer you the support you need. Start by talking to someone if you notice you are having a tough time: your spouse, best friend, doctor, or religious advisor. Connect with others who have been there, who can help you know what to expect and what things worked for them, and who will offer to be there for you if you feel you have nowhere else to go. That is one place I know we all have been! And once again, whether you are Army, Navy, Air Force, or Marines, we here at US Flag Store genuinely thank you for your service! Flag day this year brought us our fourth Show Us Yours! 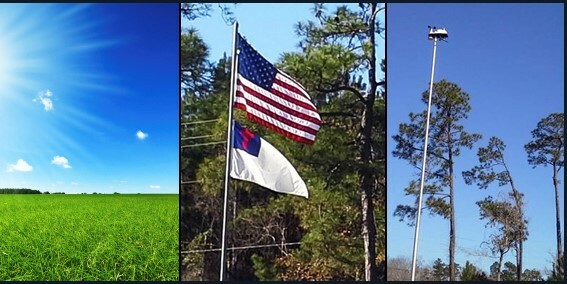 photo, from Darryl M. in Diamondhead, MS.
We love this montage that he sent us. Darryl shares that he loves to fly all the flags he orders from us, and says quality is the biggest factor when choosing! “I change them out twice a year to keep them in good condition.” This is great advice. “I also use your 20ft telescopic pole for my weather station,” he adds. Darryl, please let us know what you end up getting with your credit. Thanks so much for sharing! US Flag Stores received their third entry (second official but that’s a story for another day) in our Priceless! campaign, requesting loyal customers to show us their products in exchange for a $25 credit and tons of appreciation. The rules are simple – a photo of any of our store’s products in use, emailed to elizabeth.stubna@onlinestores.comalong with your customer email or name, and the SKU/item number of the product – will get you fame and fortune. Ok, not much of either, but some of both. Eddie (USMC) and Jacquie M. of Florida sent the photos you see here in this blog. 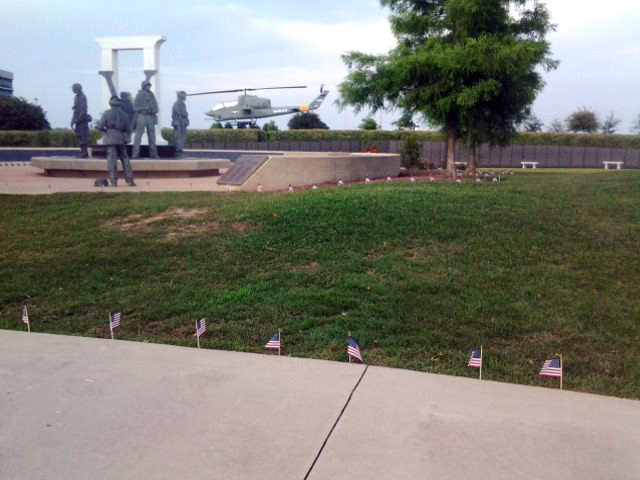 They purchased 500 of our little American made flags for Memorial Day and placed them around Veteran’s Memorial Park in Pensacola, Florida to honor others. When we notified Jacquie of the thank-you credit posted to her account, she replied, “I can’t wait until Eddie gets home. I kinda want to be selfish and get him the US Marine Corp flag, but I will wait ’til we decide together.” If thinking of picking out something for someone else is “selfish,” may we all be that selfish. Thank you to you both! I don’t know about you, but reading about 260 “displaced” factory workers in a time when unemployment is supposedly improving, really makes me mad. These are local folks who work hard for a wage that requires a second income if they want their kids to go to college – or simply to survive, if they head single-parent homes. As a country, America is a consumer nation, importing more goods than we export. What we export are services and technology. All very good things. But what the nation was founded on – hard work and tradition – is getting lost in the new economy. The reason the mill workers mentioned above are facing layoffs is because of the cheap import of steel. Their employer has been lobbying against inequity for awhile, to remain nominal in cost and continue employing its workers. But it’s just plain less expensive to import so many products. In a time when the mill was lobbying to reduce imports of steel so they could remain competitive, the imports increased exponentially. Now we see men and women who were looking forward to retiring in five years, needing to find new jobs. We see a stalwart of the American industry closing down yet another factory. We see young kids who know the value of hard work entering the field only to exit again. It’s a tough economy. And yes, United States Flag Stores does import some of their products. You can clearly see on the item description pages, the Country of Origin. It’s there for every flag so you know exactly what you are buying when you place your order. We carry some imported flags for those of you who may prefer something about them – the price, the material, your homeland (because America is the great Melting Pot!). And every customer is important; every customer is why we are in business; every customer has his or her own story. But if you do a search of all of our products, and plug in “America” for Country of Origin on our US Flag search page, you will see over 550 United States flags made right here in America – more than all other countries combined. We have thousands of US-made International flags site-wide, again far more than any other country of origin. Because we love our country. And we know you do, too. Thank you to all our loyal customers who support this American company by buying American flags.